The Lincoln MKX is an all-new crossover SUV. Sharing its car-like structure with the Ford Edge, the new Lincoln MKX offers many of the features of pricier SUVs for less cash, and serves as a step up from generic, high-volume SUVs. It offers a smoother ride and better handling than traditional truck-based SUVs and gets better fuel economy. The tight turning radius of the MKX makes maneuvering in crowded areas easy. MKX is a five-passenger vehicle. Lincoln eschewed cramming in a third row where it doesn't belong, prioritizing spacious comfort for five and their baggage. Sure, a third row could have been shoehorned in, and four or five people would be squished and luggage left behind as a result. Better to provide Lincoln's stretch-out room front and rear, along with features like heated seats and a glass roof or DVD entertainment so rear passengers don't feel like second-class citizens. Realtors and other service professionals may find this new Lincoln ideal for ferrying clients, especially those who appreciate a good view out. The MKX shows Lincoln heritage in ease of use. Getting in and out is easy, familiarization with operating controls is quick, and the driving characteristics are predictable. In terms of cargo carrying ability, the MKX can carry more stuff than a luxury sedan though not as much as a full-size SUV such as the Navigator. The new Lincoln MKX competes with the Acura MDX, BMW X5, Cadillac SRX, Infiniti FX, and Lexus RX. However, the Lincoln MKX may represent a better value than many of those competitors, as even fully loaded with all-wheel drive, navigation, big sound and so on, it doesn't top $45,000. The Lincoln MKX comes with front-wheel drive ($34,120) or all-wheel drive ($35,770). MKX comes well-equipped with leather upholstery, dual-zone climate control, heated mirrors, wood-and-leather steering wheel, and lots of chrome trim. Options include Panoramic Vista Roof with power shades ($1,895); Sirius Satellite Radio ($195); DVD navigation system ($1,995) which includes THX-certified sound system (650 watts, 14 speakers with dual subwoofers), rear-seat entertainment system with eight-inch screen, remote control and second-row wireless headphones; heated front seats ($295); heated rear seats ($295); roof rack and rails; adaptive headlights; power liftgate; reverse proximity sensors ($245); Class II tow package ($295) with 3,500 pound rating. The rear-seat entertainment system cannot be combined with the Vista Roof. Safety features include frontal airbags, side-impact airbags and curtain airbags. ABS and electronic stability control come standard on AWD models and are available on FWD models. With stubby overhangs and sizable wheel arches the Lincoln MKX presents a stylish profile not unlike some futuristic flying people-mover concepts of 20th-century animators. With a hood just longer than Leno's chin and a large expanse of glass it has almost van-like proportions but avant garde design and clever use of colors eliminates any chance of that stigma being applied. 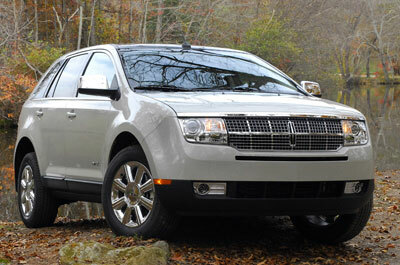 Lincoln's MKX comes from the same mold as the Ford Edge. The chrome eggcrate grille offers plenty of bling, with more shiny stuff on the mirrors, wheel covers, around the rear lamps and windows, the exhaust tips, and badges. Door handles are paint-matched and the Vista Roof is all-black, leading to a black rear spoiler and trim below the rear glass, making the window appear larger than it is. Underneath the hatch glass is a full-width taillamp like Lincolns of old, only this one is lit by LEDs. In total the MKX is clean and distinctive, neither overdone nor generic jelly bean. The cabin appears to blend traditional Lincoln luxury design shapes with a more contemporary palette of materials and colors. The soft-touch dash uses complementary color cues, dark wood trim right out of a Chicago chop house, and pewter-colored trim pieces that carry over to the steering wheel and door switch panels; only the lower door panels are obviously plastic, all the easier to clean off shoe scuffs and mud. A simple grouping of instruments faces the driver beyond a tilt-and-telescoping wood-and-leather steering wheel with redundant controls for sound and climate functions. With eight-way adjustable power seats, the MKX will comfortably accommodate any driver between the extremes of NBA forward or jockey, and the perforated leather seats are both heated and cooled, the latter good for a reduction in air conditioning use. The primary nit noted involved the fuse box that impinges on left foot room and moves the parking brake pedal far from the door; some 20 percent of the time when we engaged the parking brake, we also disengaged the fuse box cover. Back-seat riders should have few complaints because their seats offer the same dimensions as the front; the back seats recline and have seat heaters, reading lights, and a glass roof with a power shade. The back seat is comfortable for two passengers. A third rider will cut the comfort level slightly but not be slighted on safety: An adjustable center headrest and shoulder belt is provided. Cubby storage is plentiful. The glovebox is a decent size and will hold much more than just the owner's manual. The center console is so big it has a divider to keep your laptop separate from other debris. Coat hooks can handle thick plastic hangars, a great feature when picking up dry cleaning overlooked in many other vehicles. The cargo area offers generous proportions in a useful shape, doubled merely by pressing a button on the side that folds the split rear seat sections flat: No mucking about with headrests or guessing which lever does what. The load will have to be lifted above knee high, as would a flat tire being stowed under the floor, the power liftgate housing intrudes on the left side space slightly, and there is a dearth of tie-down points to secure heavy items. The Lincoln MKX is all about relaxation, comfort, and style without being saddled with dynamic response comparable to a piece of furniture. For drivers not bent on 0-60 times and engineering-speak about exactly why the car will make that turn at precisely 41.38 mph, the MKX brings all the cornering grip and stability they need while riding smoothly enough to keep their latte from spilling. MKX shares its heritage with the Mazda6 sedan and Mazda CX line of crossover SUVs, and this is a solid starting point. The 3.5-liter four-cam V6 is shared with the CX-9 and has enough oomph to easily merge an MKX or carry a full load to the slopes. Unfortunately, the six-speed automatic is reluctant to downshift unless you flatten the carpet under the gas pedal and doesn't offer the control choices of other transmission for long mountain descents or simply saving the brakes. Turn the wheel and command an MKX to change direction or stop and it won't answer as crisply as some but isn't as isolated and rubbery as others so it doesn't roll over and squeal its tires in protest. It is controlled and competent, neither fast nor slow, and won't upset anyone with bad manners like wallowing or weaving. Spend enough time on potholed pavement or low-profile tires and it's easy to make the argument that average could be a blessing in disguise. Road noise is suppressed, no doubt aided by having the wheels at the corners and away from occupants' feet and backsides. Wind noise doesn't become an issue until you've committed a speed infraction, and visibility is quite good despite the proper fitment of three rear head restraints. On the downside, some will find the central door pillar blocks their over-the-shoulder view, and the rear wiper could clear more of the glass. The all-new Lincoln MKX serves its purpose well, nicely balanced without excelling in any given arena. Its primary advantage amongst its competitors is price, as even a top-line MKX barely clears the base price of its target cross-shoppers. It may be shopped as a fancy, loaded, more traditionally styled version of the cutting Edge, with the longer warranty. NewCarTestDrive.com correspondent G.R. Whale filed this report from Los Angeles. Head/hip/leg room, f: 37.8/54.8/40.7 in. Head/hip/leg room, r: 38.7/56.2/39.6 in. Cargo volume: 68.7 cu. ft.